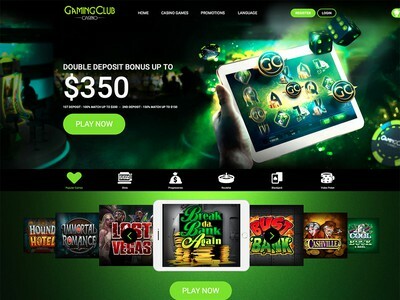 Gaming Club Casino prides itself on being the oldest online casino in the world. It is powered by downloadable and non-downloadable Microgaming software and when you register a new account you will automatically qualify for a generous 100% matching deposit bonus worth $/€/£100, plus if you get 'spotted' by the Pit Boss, you will be awarded Free Spins which can then be used on selected slots. Players can contact the customer support here 24 hours per day via Chat (live chat), Email or Telephone. Some of the telephone support is NOT available 24 hours per day. They also have an online email entry form and an FAQ section. This trustworthy online casino can be displayed in multiple different languages, it is licensed by the Lotteries and Gaming Authority of Malta and it is owned by a reputable company called Referback limited, which also owns several other trusted brands. The main game categories available here include Slots, Table Games, Video Poker and Other Games. They have a wide range of Progressive Jackpot games and registered members can also sign up for online slots tournaments and online blackjack tournaments. These online casino tournaments are only available from within the download client. Some of the top games available right now at Gaming Club Casino include Tomb Raider (Video Slot), Thunderstruck (Video Slot), European Blackjack, Mega Moolah (Progressive Slot) and Mad Hatters (Video Slot). Also keep an eye out for The Dark Knight™, Cash Splash, Jackpot Deuces, King Cashalot, Progressive Cyberstud Poker and Immortal Romance. This is a perfectly secure, eCOGRA approved online casino which continues processing timely payouts and some of the most popular online casino banking methods that are accepted here include (in no particular order), paysafecard, Ticket Premium, UseMyWallet, Click2Pay, ClickandBuy, entropay, iDeal, Visa, MasterCard, Skrill/moneybookers, Ukash and NETELLER. Download the casino software for access to more than 400 casino games or play instantly via a flash casino platform. There are more than four million registered members here and almost every day at Gaming Club Casino there is a new 'big winner'. Player Georgios M. won a life-changing €6,374,599.92 while playing on a popular progressive jackpot slot called Mega Moolah.